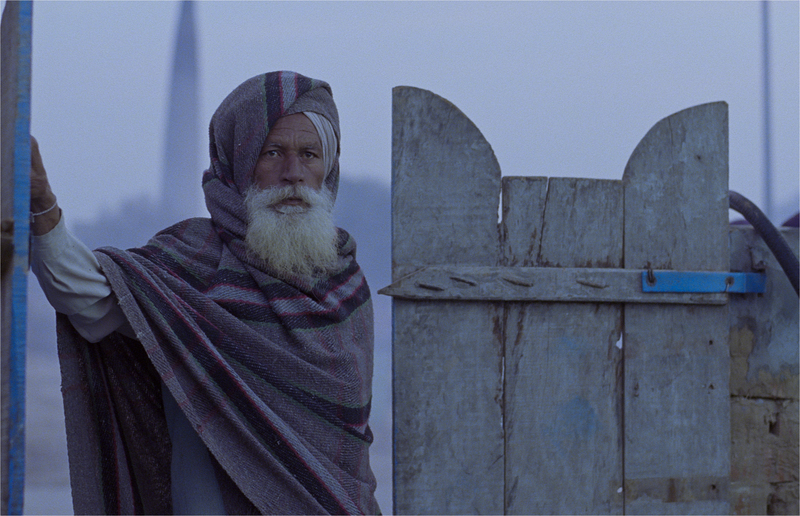 Anhey Ghorey Da Daan (Alms for the Blind Horse) isn’t a film you will watch every day. The language of the film, Punjabi, makes it an even bigger rarity. For a while now, the Hindi film industry in India, popularly known as Bollywood, has been projecting a certain version of Punjabi culture—gaudily-dressed bhangra dancers, songs laced with Punjabi phrases or dashing heroes–self-assured, upwardly mobile and often given to crass humour. Based on a Gurdial Singh novel of the same name, Anhey Ghorey breaks that pattern with grating sharpness. Rarely, if ever, was a story told about the people who are not any of the above. About those marginal men and women whose very existence is of little meaning for those who keep these people in the fringes. Here is a film encapsulating a day in the life of a Mazhabi Sikh family, who are ranked the lowest in the caste hierarchy. Yet encapsulation is probably an inadequate and even inaccurate word to describe this debut film of director Gurvinder Singh. For Anhey Ghorey is not so much a tapestry, but a number of threads hanging down a wire, even as the breeze around them threatens to rip these threads apart. The film opens with the house of Dharma being bulldozed by a powerful landlord who has sold the land to an industry. The tremors of this demolition are felt by Dharma’s neighbours, including the family that is at the centre of the story. The male elders’ collective plea to the village head or sarpanch falls on deaf ears, as his gun-wielding henchmen step forward to show the poor villagers who the boss is. Thereafter, the story moves to the town of Bhatinda, where Melu, the son of the family, is a rickshaw puller. Despite moving to the city, he finds the pasture no greener than in his village. He is still on the margins, working hard and long hours, but not earning enough to lead a life of dignity. This part—the middle of the film—can be a challenge for the mainstream/conventional viewer, who expects a turn of events to unfold. Instead what appears is a documentary-like collage of staccato images, punctuated with dialogue exchanges between stray characters. The director’s emphasis on using ambient sounds—the thunderous rumble of an approaching train, the screeching halt of a bus, the shrill noise of metals being sharpened—to amplified effects, is deliberate. In place of harmony as created by music, these sounds strike as discordant notes—announcing, as it were, that something isn’t quite all right in the world. The subtlety of the film is such that it penetrates the viewer’s psyche even without a hard-hitting linear storyline. The imagery, particularly the way the camera has been used to convey the sense of the story, is arresting. For me, the verdant fields seen through the just bulldozed walls of Dharma’s house, the mass of empty rickshaws on a day the rickshaw pullers call for a strike in the city, or the village women standing next to each other in the dark on the tense night when gunshots are heard on the streets were more telling than any spoken dialogue. The film ends in sombre irony—even as Melu’s father proceeds at night towards the city to meet his son, Melu, having had enough of the city life, returns to his village. But it isn’t just the irony that makes the scene of the father’s departure memorable. As he decides to make the journey, he seeks his young daughter Dyalo’s opinion. Her silence makes the old man, noticeably sparse in speech and defeated in silence, utter one of the most endearing dialogues of the film—“If you don’t want me to go, I will stay back.” A stoic Dyalo, however, urges him to go ahead and meet his son. Upon his return to the village–swept in uneasy darkness–Melu sees his sister Dyalo, who has ventured out of the house, unable to hold her restive spirit. Suddenly, all those threads hanging precariously are brought together—if only momentarily. 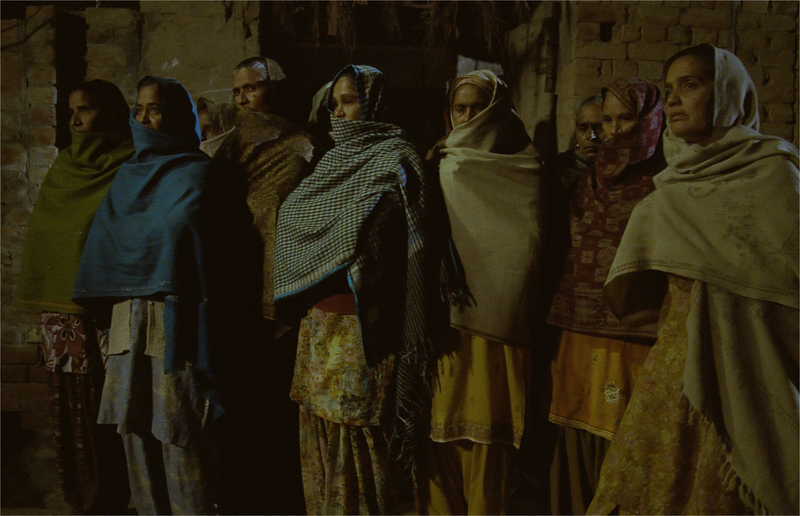 Anhey Ghorey is in the league of the best of contemporary world cinema. Both the content and the aesthetics of the film set it apart from the slew of Punjabi or Punjabi-themed films coming out of India. It might not be an easy film to watch. But then neither is the story reality of families leading sub-human lives no one cares about, an easy one to come to terms with. Read another review of the film here. Bhaswati – excellent review and I’m hoping I can see this movie in the US.. it sounds groundbreaking and starkly beautiful. I sure hope you can see this film, Joyce. Groundbreaking and starkly beautiful are good words to describe it. It is layered in craft and remarkable in content. excellently written. I had expected it to be so. Thank you so much, Bina. Do see the film if you can; a discerning viewer like you will definitely appreciate it. As always,Bhaswati,your writing is straight,unpretentious…what a beautiful critique.You have the potential of a good art/film/theatre critic.I must see this film the soonest. Thanks, Harish ji. I sure hope you can see this film; I will await your review. Beautiful story of power, margin, helplessness and human predicament. I felt moved by this story of Premchand’s genre. I couldn’t agree with you more, Anand. This is one compelling story indeed. I loved reading this. Especially when you mention that Bollywood has projected a different picture of Punjabi culture. This is so true. Whatever idea foreigners are having of Indian culture is what they see in Bollywood films. And Bollywood is so deceiving. They project a colourful, musical world and make India look like a travel brochure. Lovely analysis you’ve made there. One question. Can I find this film on DVD? One more question. Can I find one more Punjabi film, ‘Shaheed-e-Mohabbat’, featuring that famous song “Ishq da Rutba” by Nusrat Fateh Ali Khan, on DVD? An excellent review , Bhaswati Ghosh. I’ll definitely see the movie now. You are right, till now Punjabi cinema has never been taken up seriously by film directors; but films like this are an assurance that there is lot of potential in Punjab and Punjabi language for good cinema. Thanks for your comment, Narinder ji. I completely agree with you–with this film, serious, non-commercial minded filmmakers should feel confident of making the films they want to, not the one producers want them to make. I will look forward to your review of the film. Bhaswati: I loved going through your review. Now I want to watch the film. I hope that I can get it in Karachi on DVD. I wonder why it is called “Anhey Ghorey Da Daan”!? Maybe it is a proverb in Punjabi. Fantastic Review… I have watched the film several times and couldn’t stop myself watching again and again. Silence speaks more than words… Beautiful piece of Art. I would appreciate if you could recommend me some movies of similar genre. I have watched movie Gaman which resembles to a similar craft of movie making.